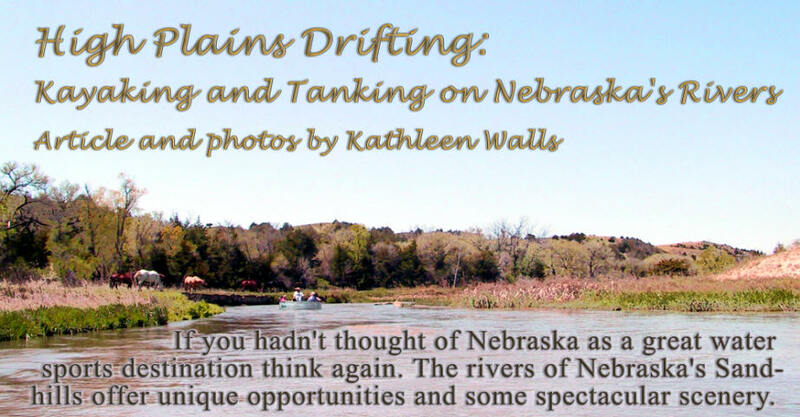 I recently went kayaking with Doug Graham of Graham Canoe Outfitters located near Valentine, Nebraska. 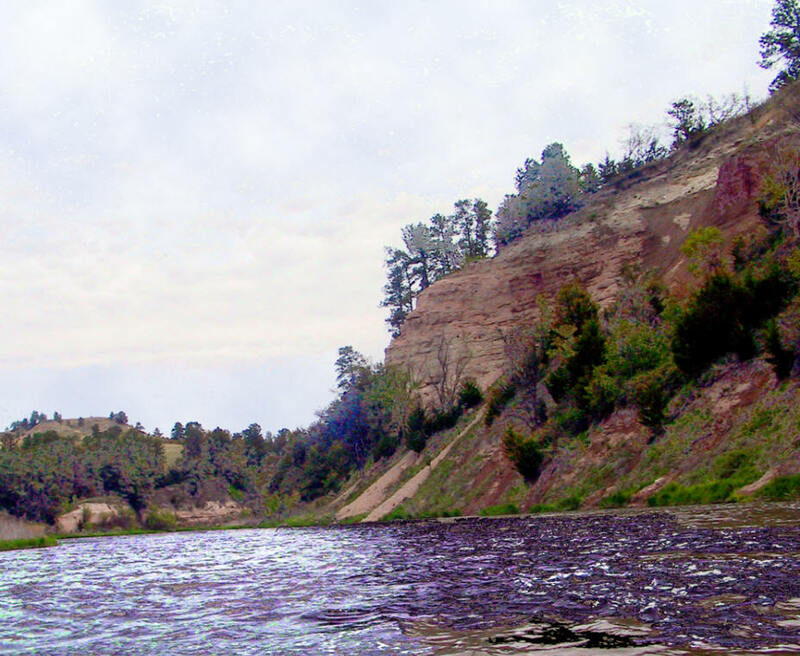 He took us to the Niobrara River which begins in Wyoming and travels 535 miles until it flows in the Missouri River in northeast Nebraska. 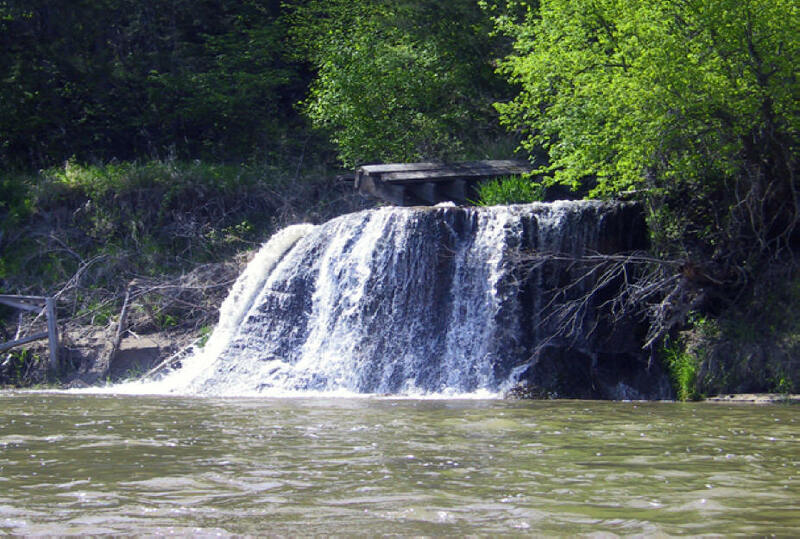 Seventy six miles of the river is named a National Scenic River. 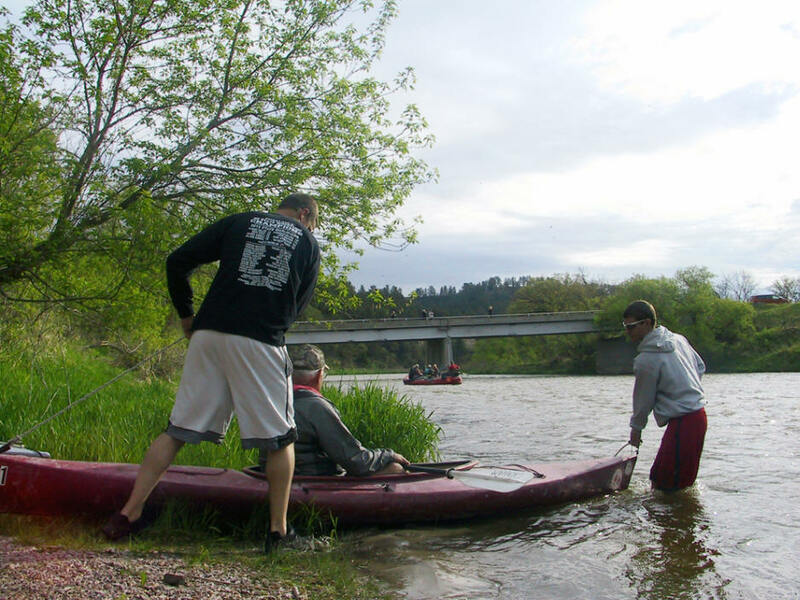 We put in at Cornell Bridge in Ft. Niobrara National Wildlife Refuge and paddled for three hours to Smith Falls State Park. The trip took us through several different ecosystems and the cliffs along the banks told a geological story of the river's birth. On both sides, the sandstone banks showed the layers of time where the river had cut a valley 200 to 300 feet deep into the earth and between one-half to two miles wide. The bedrock beneath the river bottom is a hard pinkish gray ranging to brown sandstone called the Rosebud Formation. Multiple waterfalls, some tiny ones create a trickle into the stream: others like Smith Falls pour vast amounts of water into the river. The sandhills through which the river passes are an interesting geological feature. This area was once a vast inland sea. The sandhills are remnants of dunes that have become stabilized over the centuries by the prairie grasses. Once buffalo and elk grazed these plains. 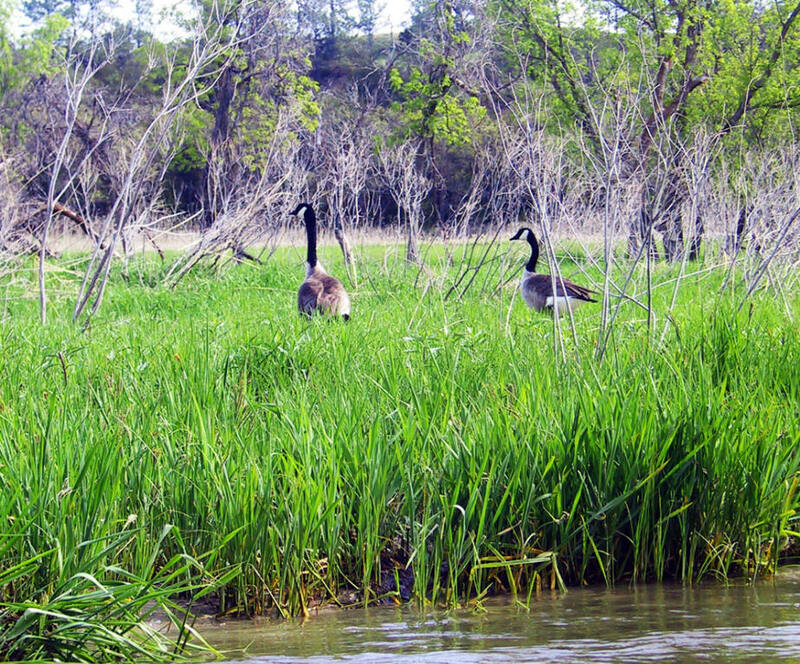 Today the Wildlife Refuge is home to about 160 plant and animal species including birds such as indigo and lazuli buntings, yellow-shafted and red-shafted flickers, and Baltimore and Bullock's orioles, Mammals such as white-tailed deer, raccoons, coyotes, squirrels, eastern cottontail rabbits, mink, beaver and river otter are seen often. Occasionally a moose might be spotted. We saw quite a few birds but I was not able to identify any other than the Canada goose. We took a brief rest stop at Berry Bridge. This is a great place to break. There are rest rooms, tables and water. There is a small shack that sells snacks, soft drinks and beer but it wasn't open when we stopped. Smith Falls Park is another great stopping spot. 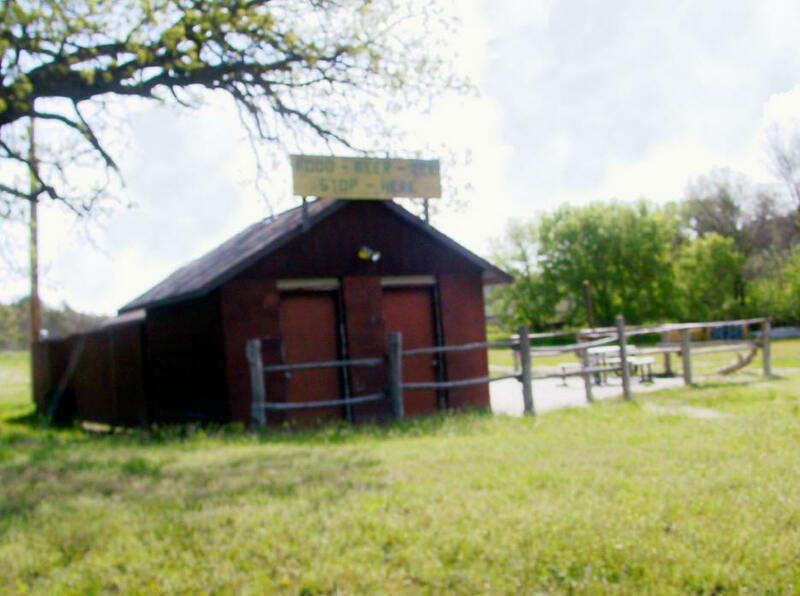 This was our take out spot where we found tables a shelter, a great fire circle and restrooms. Doug's wife, Twyla, and some other ladies from Graham Canoe Outfitters met us there and provided refreshments. What a treat. What's the most unlikely scenario for river fun? How about hopping into a cattle feeding tank and floating down a river. Well, it's not just wild imagining. We did just that on Middle Loup River with Mitch Glidden of Sandhills Motel and Canoe rental. Tanking is a relatively new sport that seems to be practiced almost solely in Nebraska so far. 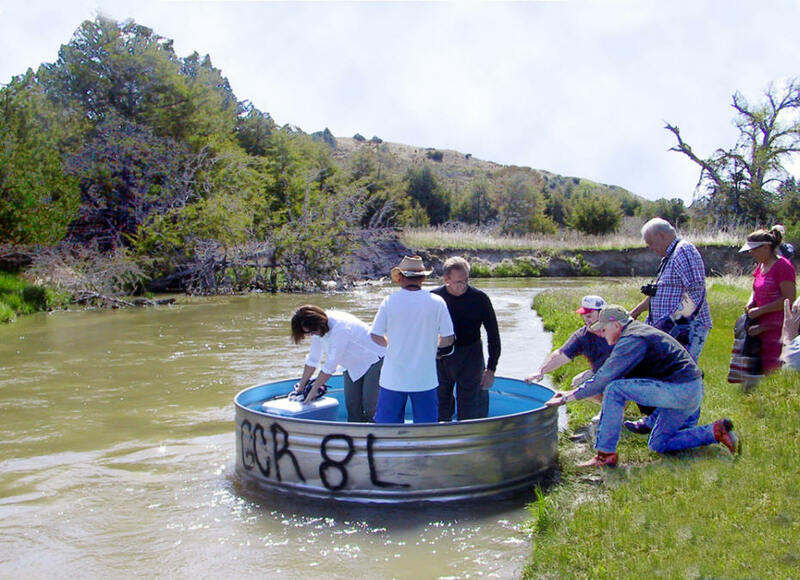 Instead of floating down a stream in a kayak, canoe, raft or even a tube, I found myself in a round feeding stock tank with about a seven foot diameter made of heavy gauge plastic and fitted with seats around the rim. Some are as large as nine feet. 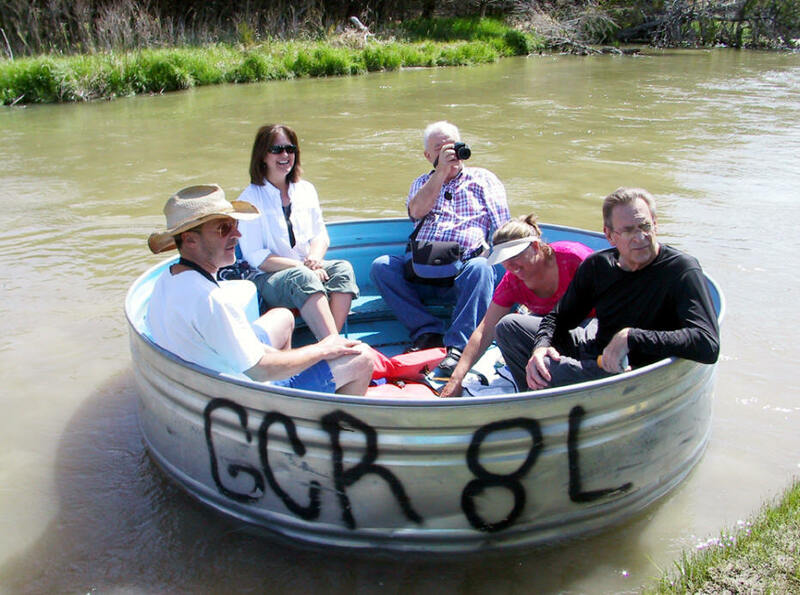 They seat up to eight people and are practically unsinkable. They are also unsteerable. We were equipped with oars that could be used to keep from getting caught up in patches of grass or tree limbs in the water. When we drifted into the banks. We could push off with the oar and the current would once again carry us towards our destination. Luckily Mitch accompanied us and gave us a running commentary not only on the sport of tanking but the natural environment of the Middle Loup river. Middle Loup River flows just north of Mullen. It's part of a series of rivers along with North Loup and South Loup that eventually flow into the Platte. 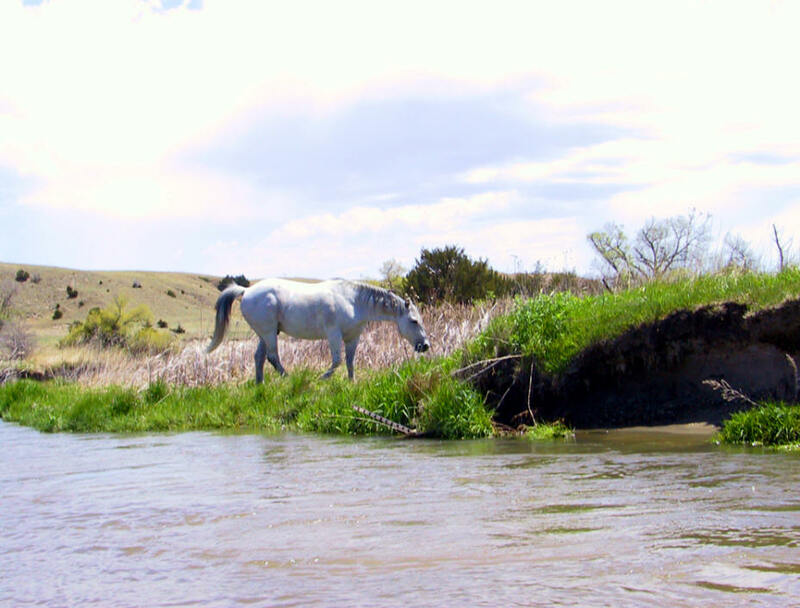 Middle Loup curves through sloping canyons in the Sandhills and is spring-fed with relatively calm waters. It has enough twists and turns to make it interesting. You always wonder what's around the next bend. We spotted a few cattle and some horses on the trip. The thing that makes tanking different is the stability of the tank. It is almost impossible to turn over. We were able to all enjoy a leisurely lunch as the river carried us along with little or no help from us. It's a wonderful way to enjoy a relaxing day on the water.